The Bridges Crew was one of the original crews for the 492nd BG that trained in Alamogordo, New Mexico. They had transferred into the Group as crew 93 from the 331st CCTS (Combat Crew Training School) in Casper, Wyoming. No personnel changes were made. 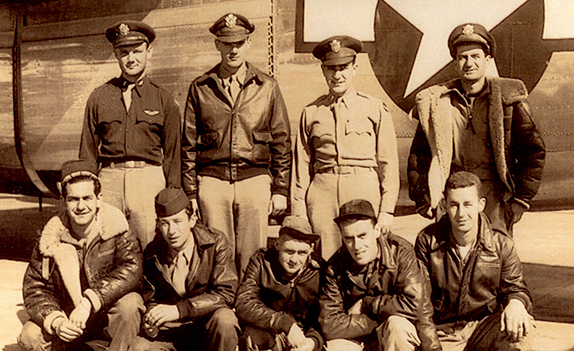 They were assigned to the 857th BS, designated as Crew 702. Lt Wyman Bridges signed out for a B-24J, 44-40157. They nicknamed their ship, LUCKY LASS. In April 1944, they flew their assigned aircraft to North Pickenham, England, via the southern route. Their ground Crew Chief Sgt Salaun flew with them, thus bumping Sgt Hammer onto the Queen Elizabeth. By our count, Lt Bridges flew as the aircraft commander for Crew 702 for a total of 28 missions plus an aborted one. Come 6 July, co-pilot Lt Tracey swapped places with Lt Gaines, pilot of Crew 715. Aside from the noted changes in this summary, no one missed any missions as the crew flew all of their missions together. LUCKY LASS was an appropiate name for their ship as they had survived one of the worst air battles inflicted upon the 492nd. On 19 May 44, they got shot up by the German Luftwaffe while approching their target over Brunswick. The initial enemy hits caused damage to two of their engines, their right aileron and started a fire in their oxygen system. Three of the crewmen were wounded in the battle. But their problems had only just begun when a Me-109 collided into their ship's rudder. The impact sheared off the German fighter's wing and tore off half of the LUCKY LASS' right vertical tail. Somehow the LUCKY LASS made it back to England. Lt Bridges was decorated with the Distinguished Flying Cross for bringing his crew and plane back. S/Sgt Garside was credited for shooting down an Me-109. Lt Tracey's wounds were minor and back in action for the crew's next mission. Sgt Rose's wounds were serious enough to send him back to the States for recovery. On 13 June 44, he was replaced by S/Sgt Knight from the Ogden Crew 606. Lt Safier's wounds required hospital treatment. Within a few weeks, Safier returned to the crew but perhaps prematurely. He was extremely nervous and gun-shy and the crew felt they could no longer depend on him. After flying two or three more missions he was transferred out of the Group. Safier was never replaced. From this day on, they flew as a nine-man crew. While the LUCKY LASS was being repaired, they kind of took possession of a replacement B-24, 42-95023, which had just arrived. They named it LUCKY LASS II. It's unclear if the LUCKY LASS II came without a ball turret or if it had been removed at North Pickenham, but this plane didn't have one. The Bridges crew stood down when the group encountered their next rough mission on 29 May 44 to Politz. However, S/Sgt Garside and Sgt Berger volunteered to fill in on two other crews. S/Sgt Garside flew with the Davis Crew 704. When they were over target, he noticed the gas gauge was lower than it should be. He looked at the instrument panal in the cockpit and saw they were running their engines on auto-rich. "Excuse me Captain, but if you don't switch to auto-lean now we will not make it back. In fact, I'm not sure if we have enough fuel to get back." They crossed the Channel on fumes and crashlanded at an airfield at Oulton. No one was injured but it was a rough landing. When Lt Bridges flew over to pick them up, Garside told him he would never fly with another crew again. The luck of the Bridges Crew wasn't predicated on what plane they flew or what name it had. One might say those planes were lucky to have been flown by them. Flying the LUCKY LASS II, they survived the second Politz mission on 20 June 44 which cost the Group 14 crews. Sadly, their bunk mates from the Liggett Crew 701 were among the missing. On 7 July 44, the Bridges Crew hit the trifecta by getting in the middle of yet another fierce air battle. This time they were flying, WE'LL GET BY, and that they did. T/Sgt Garside and T/Sgt Berger have the distinction of having flown every tough mission the 492nd had. With the exception of the first time the McMurray Crew 801 was shot down on 15 June 44, they witnessed every one of the 492nd's lost planes getting hit by the enemy. When the group was disbanded, the Bridges Crew 702 was transferred to the 44th BG where they completed their tour of 31 missions. The LUCKY LASS II went to the 392nd BG where it wasn't so lucky. It was involved in a mid-air collision during assembly on 12 August 1944. 7 KIA, 1 WIA, 1 RTD (returned to duty). Eventually Lt Safier regained his confidence and was assigned to the Rhine Crew at the 389th BG. He was killed on 21 November 1944 when their plane collided with another plane during assembly. 9 KIA, 2 RTD.